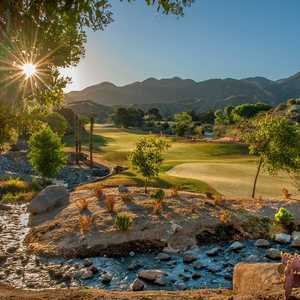 VALENCIA, Calif. -- The latest in the now 23-strong collection of Tournament Players Clubs is the TPC Valencia, an hour north of downtown Los Angeles and but a stone's throw from the stomach-roiling roller coasters of Magic Mountain. I'll take the gentler elevation changes of the golf course, thank you very much. Valencia, named for the ubiquity of oranges that once grew in the groves of this area, is one of those fully formed, mega-mall communities that seem to spring up overnight where virgin hills and hot sun used to dwell in solitude. 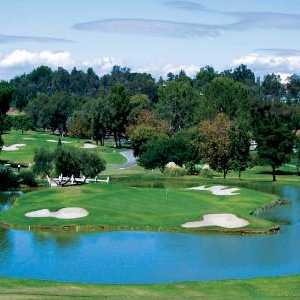 The TPC course -- developed in partnership between the PGA Tour and Newhall Land -- is the centerpiece of a sprawling, luxury housing development that straddles the front nine, while the back meanders through a protected oak preserve and feels much more country than city. 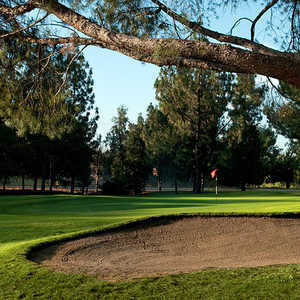 Newhall Land & Farming had proposed developing the site and building the course almost 20 years ago, but numerous lawsuits and environmental concerns got in the way. The course finally had its grand opening on June 26, 2003. PGA Tour Designs chief architect Chris Gray drew it all up with star golfer Mark O'Meara acting as consultant, carving the course out of 133 rolling acres. It measures a whopping 7,260 yards from the tips, and thus will potentially be home to some Big Name events as the course matures. But Gray had ordinary mortals in mind as well, insisting that the "first consideration was that the course had to be fun to play." Head professional Jennifer Folino adds that "people have found the course challenging, but they seem to like that. It might be a little difficult, but that's not a bad thing. And even with the heat, we have been getting good numbers and play is up over what we anticipated. As a whole the club is doing well." TPC Valencia, with its capacious fairways and trademark greenside catch areas, is eminently playable, as long as you choose the proper tees from the five available. The 606-yard 14th hole is a more hospitable 516 from the whites, and the drivable par-4 17th a mere 231 versus 296 for those big hitters in search of eagle feathers. The 515-yard 15th hole features two heroic carries, an uphill blind drive akin to the 18th at Riviera, and a harrowing approach over a barranca and hovering oaks to an elevated and slanting hillside green. The elevation changes are more dramatic on the back nine, as are the vistas and the feeling of isolation from the city's hustle-bustle. According to the PGA, introduction of hazards was kept to a minimum because of the naturally occurring oaks and rolling terrain that are major tests in themselves. The TPC at Valencia has only two water hazards -4 lakes on two of the par-3s, Nos. 4 and 9. There are only 27 bunkers. The greens are getting a little more receptive as the summer sun relents, making the course friendlier to approach shots, but the fun doesn't end there. TPC Valencia's putting surfaces are not too funhouse and sloping, but they do have subtle undulations that don't become apparent until you've made your way around here a few times. The service and politesse of the staff here is exemplary, as is the case at most of the TPC courses. Try to make it on a Friday for the Spanish tapas menu at the Oaks Grill, as good a meal as you'll find in the Franchise Wilderness that is Valencia. There's even live music, so bring your soft-spikes dancing shoes, and if that's not excitement enough you can always take the five-minute drive to Magic Mountain for some real thrills and spills. Other amenities: a 65,000 square-foot, double-ended practice range with three tiers and a putting green of 10,000 square feet. Due to the theme park's vicinity, there are many and varied places to stay for a few nights -- all the Inns are here: Comfort, Days, Hampton or Residence, and even a Hyatt for those needing a cushier setting. Lake Castaic is a short drive for you boat and bait types, and Robinson Ranch and Lost Canyons each have 36 challenging holes just down the road a piece. For those unfamiliar with the Los Angeles area, Valencia is one of the last L.A. stops as you head over I-5 Grapevine on your way to Northern California. As bad a course as I have played in years. What a disaster.